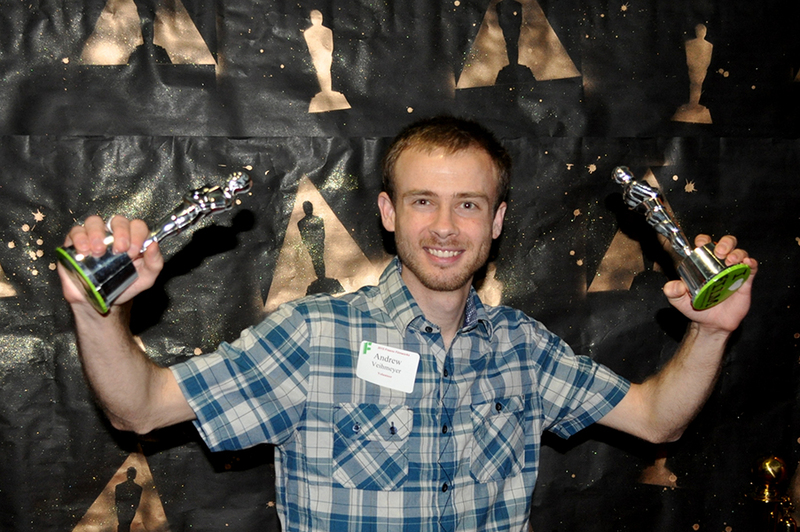 The Academy would like to congratulate Andrew Veihmeyer on his volunteer achievements with Filmworks. February 2015 volunteer in the spotlight: Andrew Veihmeyer. Occupation: A native of Santa Maria on the Central Coast, Andrew graduated from Fresno State in 2012 with a degree in Communication. Since then, he has worked as a marketing intern for several local businesses and nonprofit groups, including Sebastian and the West African Vocational Schools. He also served as the Filmworks marketing intern in summer 2013. Andrew has a passion for writing, and he plans to pursue a career in public relations. He currently works part-time at Target while pursuing a freelance career as a writer for Central California Life Magazine, producing interviews and feature stories on San Joaquin Valley subjects. What is your typical volunteer job, and what do you like most about it? Andrew routinely helps with marketing support, including data entry from Filmworks audience surveys. He also enjoys selling tickets on screening nights, having the opportunity to meet people right at the door as they rush in prior to showtime. Filmworks thanks all of our February 2015 volunteers: Avigdar Adams, Cleo Bauer, Rita Bell, Lorna Bonyhadi, Richard Flores, Megan Ginise (intern), Rebecca Horwitz, Carl Johnsen, Kathryn Johnsen, Monica Marks-Rea, Sarah Nixon, Dominic Papagni, Gene Richards, Susan Rogers, Richard Stone, Kristin Torres, Andrew Veihmeyer, Jon Veinberg, Olga Verkhotina, Analise Villalobos, Suzanne Watkins.